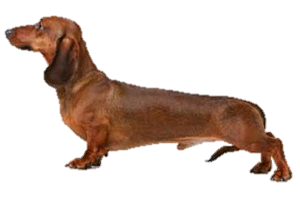 Although classified by many kennel clubs as a hound, the Dachshund in fact works as a terrier. These small dogs go to ground for badgers and other small prey such as rabbits and fox. Today they are more commonly found as companions. Each of the Dachshund’s coat varieties has a slightly different history, which the smooth being the oldest. Their exact origins are unknown, although some believe their ancestors may reside in ancient Egypt. Engravings have been found with short-legged hunting dogs, and recently mummified dachshund-like dogs were discovered in burial urns. It seems more likely that the French brought low-slung bassets with them to Germany when fleeing France during the French Revolution. Originally the breed was called the Dachs Kriecher (badger crawler) or Dachs Krieger (badger warrior), well known for its use in badger hunting. Later they would be come known as the Dackel or Teckel, names that are still recognized in its homeland. The longhaired variety was probably developed by adding short-legged spaniels to the line, similar to the Sussex or Field Spaniels, while the wirehaired was likely caused by the addition of rough haired pinschers that would be similar to today's Schnauzer. Is the Dachshund Right for You?